Catapults (onagers) of the Roman Empire were mainly used for besieging forts or settlements. They would often be armed with huge stones or rocks that could be covered with a combustible substance and set alight. 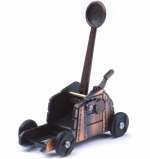 Our Roman Catapult is made from metal, with plastic wheels and has an exciting working firing mechanism. The catapult also incorporates a pencil sharpener.